Misinformation nurtured Indiana’s opioid crisis. As addictions and overdose deaths have skyrocketed, it has become clear that many of the doctors who were prescribing them and most of the patients who were taking them underestimated the dangers of opioid-based painkillers. Efforts to make pain the "fifth vital sign" in health care, coupled with aggressive marketing of hydrocodone and other pain pills by the pharmaceutical industry, led doctors to prescribe those drugs too freely. Though it’s not clear why, Indiana has had one of the highest opioid prescription rates in the country. Now, as The Journal Gazette’s Ron Shawgo reported Sunday, the pendulum is beginning to swing in the other direction. 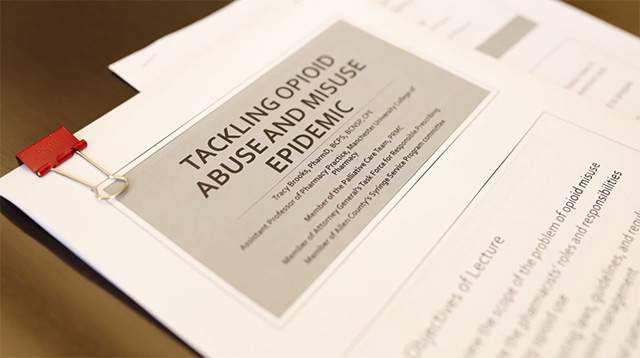 The Indiana Attorney General’s Prescription Drug Abuse Prevention Task Force and the Governor’s Task Force for Drug Enforcement, Treatment and Prevention have helped improve and publicize guidelines for prescribers while raising awareness among doctors and the public of the dangers of opioids. The state has increased scrutiny on pain doctors who overprescribe. More training and faster reporting requirements for the state’s INSPECT prescription-reporting system have allowed pharmacists to become full partners in the battle. Attention is now turning to the problems of treating those who have become addicted, and to those who legitimately need to use opioids to reduce pain. As Shawgo reported, Barbara Andraka-Christou, a post-doctoral fellow at Indiana University-Purdue University Indianapolis’ Fairbanks School of Public Health addressed that problem at a conference on drug abuse in Indianapolis last month. With the right training and resources, Andraka-Christou said, "primary-care physicians can do a perfectly fine job treating addiction." But Andraka-Christou said studies have found many primary-care physicians may be reluctant to administer anti-addiction drugs such as methadone or buprenorphine. For example, she pointed to Pew Charitable Trusts research released this year that shows 900,000 doctors nationwide are authorized to prescribe oxycodone, the high-power opioid that fueled last year’s drug/HIV/hepatitis C crisis in Scott County, Indiana. But only 32,000 can prescribe buprenorphine, which can help detoxify addicts and control the chronic pain that may have led to their addiction. Pew also reported that Indiana is sixth lowest among the states in the percentage of opioid addicts for which buprenorphine is potentially available. Focus has been on the undeniable need for more addiction-treatment centers, but it’s also clear that many addicts and even many physicians aren’t aware of resources that are now available or how to connect with them. But this is changing, too. Indiana University’s medical school and the Manchester University School of Pharmacy are among institutions that have added coursework focused on pain medication and drug abuse, Shawgo reported. Training for medical professionals is also available through the Drug Abuse Prevention Task Force. In this area, the Lutheran Foundation’s new LookUpIndiana.org website is ready to connect addicts as well as those with mental health problems with help. As the fight against opioid abuse continues, it’s important that the swinging pendulum doesn’t affect those who truly need opioids for chronic pain. Tracy Brooks, professor of pharmacy practice at Manchester University, told Shawgo of a case in which a pharmacist resisted refilling a painkiller prescription for a customer who looked suspiciously emaciated and disheveled. In fact, the man was suffering from stage 4 cancer. Other patients, having heard the stories about the dangers of addiction, have to be reassured to take even limited prescriptions. With more thorough training for professionals and continuing efforts to educate the public, this problem can be minimized as well. We have a long way to go in this life-or-death domestic war. Lack of knowledge still is the most significant impediments to resolving it. But there are hopeful signs medical professionals are getting better training and patients are becoming better informed. The most powerful weapons that can be deployed against opioid abuse are information and awareness.